Sanskrit poetry offers scope for several studies from the purely literary and aesthetic point of view but unfor- tunately the pre-occupation of Indology with the use of Sanskrit literature for the setting up of historical and chronological skeleton-frames has deadened, so to say, the finer sensibilities and enjoyment of the Sanskrit muse in her rich and variegated expressions in the epics, the long and short poems, and in prose and drama. The earliest impact, abroad, of Sanskrit was in the purely literary world and today the interest in its literary values is increasing as seen in the continuous production of translations of Sanskrit poems, plays and narratives. In the midst of my pre-occupation with manuscripts- survey and the New Catalogus Catalogorum, I have been, off and on, making contributions to the literary study of Sanskrit creative writings, but have not been able, so far, to do more in this line. 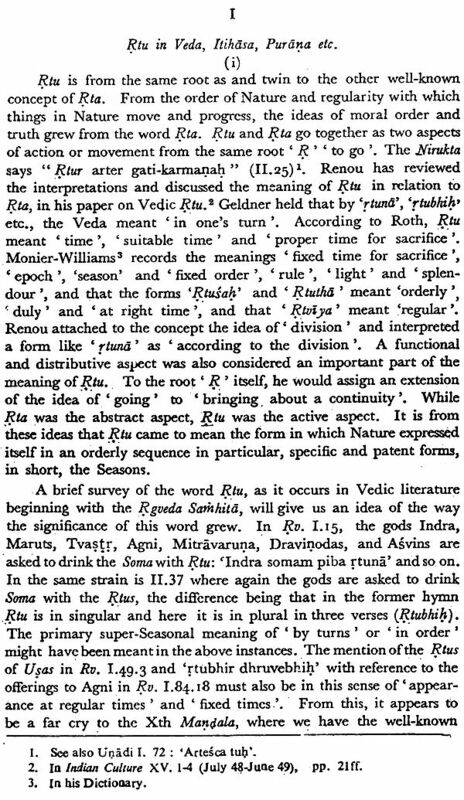 Of the several subjects of this kind, one that had long been on my mind is the idea of Rtu and the beauty and appeal of Rtu-poetry in Sanskrit. My thanks are due to the authorities of the Sri L. B. S. Kendriya Sanskrit Vidyapitha, Delhi for giving me an opportunity to take up this subject and deal with it in a course of three lectures under their annual Saradiya Jnana Mahotsava endowment. To Dr. R. K. Sharma, Director of the Rashtriya Sanskrit Samsthan, Ministry of Education, to Sri Chapa- lakanta Bhattacharya, M. P., Chairman, and Dr. Mandan Misra, Principal, L.B.S. Kendriya Samskrta Vidyspitha, I must express my gratitude for the arrangements they made for these lectures and the interest they evinced in their publication. It is a matter of gratification to all of us that this book could be brought out on the occasion of the first International Sanskrit Conference of the Ministry. Dr. S. S.Janaki, my former student, helped me with the reading of the proofs and the checking of the Indexes. The M. L. J. Press (Private) Limited is to be thanked for the printing of the work. I have great pleasure in introducing 'Rtu in Sanskrit Literature' representing the learned lectures delivered by Dr. V. Raghavan during the Saradiya Jnana Mahotsava held in 1971 under the auspices of the Shri Lal Bahadur Shastri Kendriya Sanskrit Vidyapeetha, Delhi, one of the leading Sanskrit institutions in the country working under the Rashtriya Sanskrit Samsthan. Right from the constitution of the Sanskrit Commission, there was not a single activity for the propagation and development of Sanskrit undertaken by the Ministry of Education in which Dr. Raghavan has not given his valuable contribution. As a scholar par excellence and as an intellectual giant, he has an International reputation extending over four decades, As an ardent student of Sahitya and himself a composer, and as a connoisseur of art and music, he has placed his versatile gifts at the service of several cultural organisations in the country. Nobody could have been a better choice than Dr. Raghavan for delivering these lectures on the Seasons as depicted in Sanskrit Literature, under the auspices of the Vidyapeetha. He has fulfilled this assignment admirably. The Vidyapeetha authorities have great pleasure publishing the lectures delivered by him. Not only did he take the trouble of delivering these lectures and agreed to get them published, but even the honorarium that was paid to him for these lectures was donated by him for the benefit of the Vidyapeetha. The Rashtriya Sanskrit Samsthan and Shri Lal Bahadur Shastri Kendriya Sanskrit Vidyapeetha are therefore both indebted to him in more ways than one. We look forward to many more such opportunities when the fruits of his long years of ceaseless endeavour in the field of Sanskrit research will be made available to us. I may assure him that the Vidyapeethas and the Samsthan are always ready to make his researches available to the wider Sanskrit world. I. RTU IN VEDA, ITIHASA, PURANA Etc. Rtu in Sutras-Rtu and the periodic Istis (pp. 6-7). 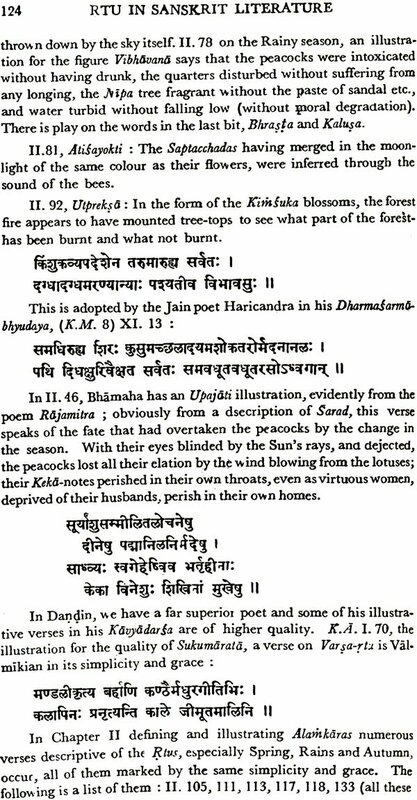 (ii) Rtu in Valmiki's Ramayana-Sanskrit epic poetry, product of Nature and forest. Sanskrit and Greek epic poetry contrasted, in respect of love of Nature-Love of trees, flowers etc. of Valmiki and his characters-Valmiki, the model for treatment of Rtus in Sanskrit poetry (pp. 9-11)-Seasons as part of poetry-Three aspects: Integration of episodes etc. 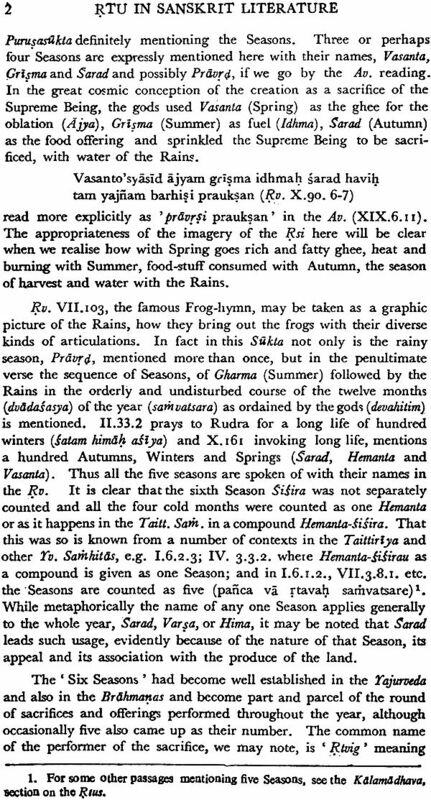 with Seasons, Rtu as Uddipana Vibhava and the sublimity of Rtu transcending the sentiment of the context-Example of these from Valmiki-Descriptions of the different seasons by Valmiki and their highlights. Varsa and Sarad Varnanas of Book IV-Appreciation of these-Echoes of the pictures here in later poetry (pp. 11-18). Meagre treatment of Rtu in Mahabharata (p. 19). (iii) Rtu in the Puranas and Upapuranas -In Visnu Purana - Spiritual orientation of the treatment (21-23)-The same compared with that in the Bhagavata (23-27). (iv) Rtu, health and Ayurvedic works-Garaka and Susruta (pp. 31-35). Rtu in Kama Sutras of Vatsyayana and Artha Sastra of Kautalya (25). The Rtusamhara-Arguments against its authenticity answered-Detailed analysis and appreciation-Comparison with other works of Kalidasa-It scheme, style and charm-the world of the Rtusamhara-Demonstration of its being a work of Kalidasa-Aurobindo on it-A poem of seasons and a poem of love (pp. 38-58). 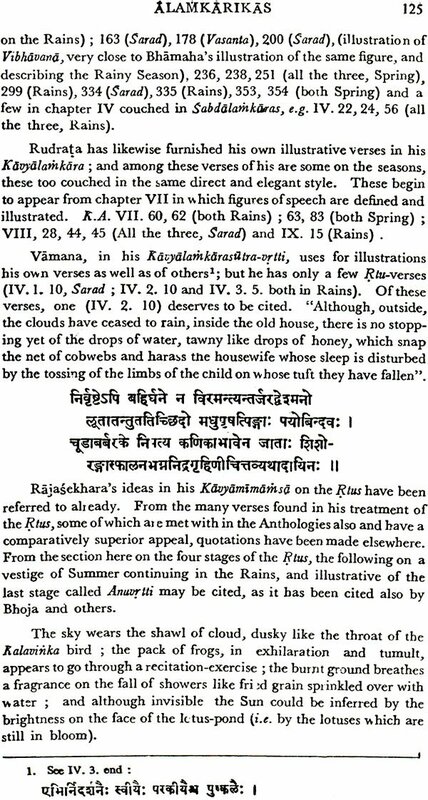 Kalidasa, the Cloud and the Rains-Vikramarvasiya Act IV-Meghaduta (48-62)-Imitation by Bhavabhuti in Mala-timadhava, Act IX (62)-Spring in Vikramarvasiya (62-63)- Raghuvamsa-Sarad in Canto IV-Spring in IX-Rains in XIII in a flash back-Summer in XVI. 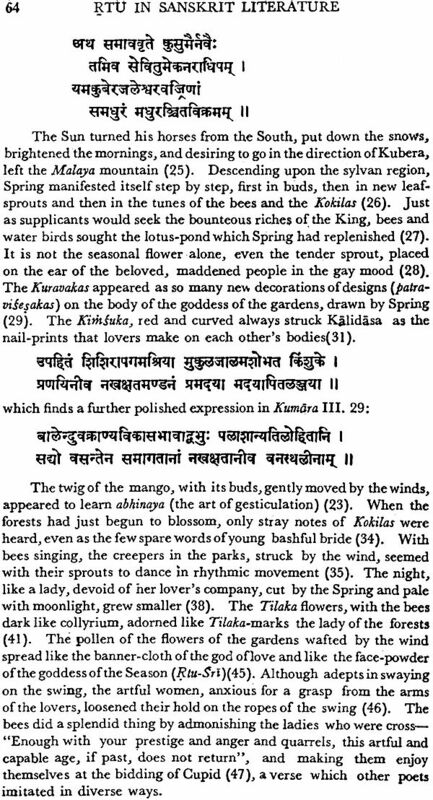 Kumarasambhava -Spring in Canto III (63-67), his masterpiece (67-69). Malavikagnimitra -Spring and Asoka-dohada part of the plot (70-71). 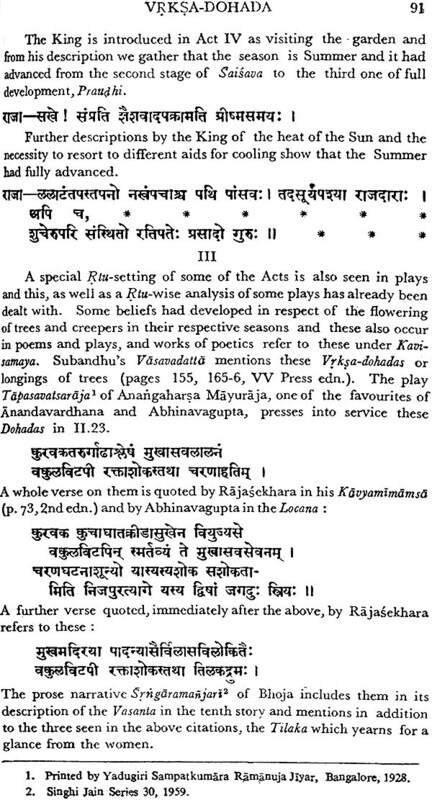 Abhijnanasakuntala-a Rtu-wise analysis of the drama beginning with Summer in the Prologue and Spring in Act VI, providing a parallel to Rtu-samhara (71-73). Bharavi-his Sarad-varnana in Kiratarjuniya Canto IV. A masterpiece-the six seasons in canto X (73-75). Kumaradasa: Spring, Rains and Autumn in Janakiharana III, XI and XII-Estimate of his treatment (75-77). Bhatti-The Sarad in Ravanavadha II, his best-echoes of Bharavi clear (77-78). Magha-Rtus in Canto VI of the Sisupalavadha (78-79). Bhartrhari-Rtus in his Srngarasataka 81-100 (79-80). 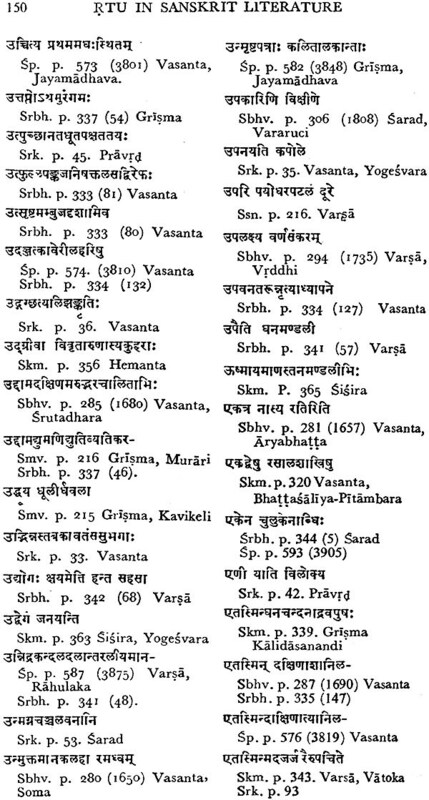 Rtu-varnana and Alliteration-Examples from Valmiki, Kalidasa, Kumaradasa, Magha and Sivasvamin (KapphinabhyudayaVII) (80-81). Sudraka: Special character of his use of Rains in Act V of Mrcchakatika (81-82). Visakhadatta -Sarad in Act III of Mudrarakasasa (85-83). Sriharsa -Spring festival at the opening of Ratnavali-Rtu-wise analysis of the play and Priyadarsika (85-86). Gaturbhani-Rtus -in Padmaprabhrtaka, Dhuriavitasamvada and Ubhayabhisarika (86-88). Rajasekhara-Rtus in Balaramayana-Special features like the stages of Rtu-Arambha etc. in his Viddhasatabhanjika (90-91). Rtu and poetic conventions-Vrksadohadas--Rtu and the states of its appearance, growth, blending with the next and vestiges of the disappearing Rtu in the next-Notice of the above in poems, plays and works of poetics-Bhoja's special treatment of the Rtu-stages. Rtu as Uddipana Vibhava-Bharata's treatment-Rtu-abhinaya-Symbolic Rtu-themes in Dhruva-songs in Bharata-Rtus and Ragas (91-96). Jain Mahapurana (Adi and Uttara) of Jinasena and Guna-bhadra; Abhinanda's Ramacarita; Ksemendra's Ramayana-manjari; Bilhana's Vikramankadevacarita; Jayadeva's Gita-govinda; Haricandra's Dharmasarmabhyudaya; Lolimbaraja's Harivilasa (97-102). 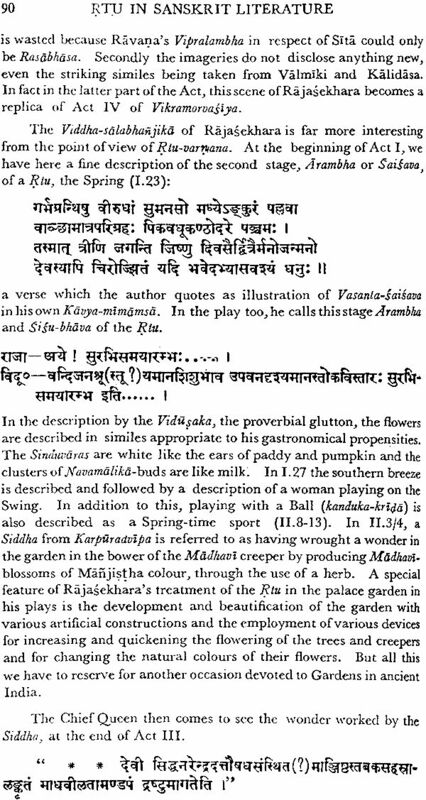 Bana's descriptions, especially in Harsacarita -Summer-Sarad in Ucchvasa III, his best performance (103-106). In Dandin's Dasakumaracarita (Avantisundari) (108-109). In Trivikrama's Nalacampu and Somadeva's Tasastilaka (109). In Dhanapala'sTilakamanjari; Bhoja's Srngaramanjari; Description of Rtu-stages in the latter; Soddhala's Udayasundarikatha; Vadibhasimha's Gadyacintamani; Haricandra's Jivandharacampu (109-113). Panini, Bhasa, Bana, Mayura, Bhavabhuti, Visakhadatta, Avantivarman, Bhaskar, Laksmidhara, Bharscu, Satananda, Yogesvara, Vacaspati, Vaisya, Bhutanatha, Pitambara, Gopika, Virinci, Piyaka, Mahamanusya, poetess Vijjika, Bhoja (113-120). Anonymous Rtu-verses in Anthologies (120-123). 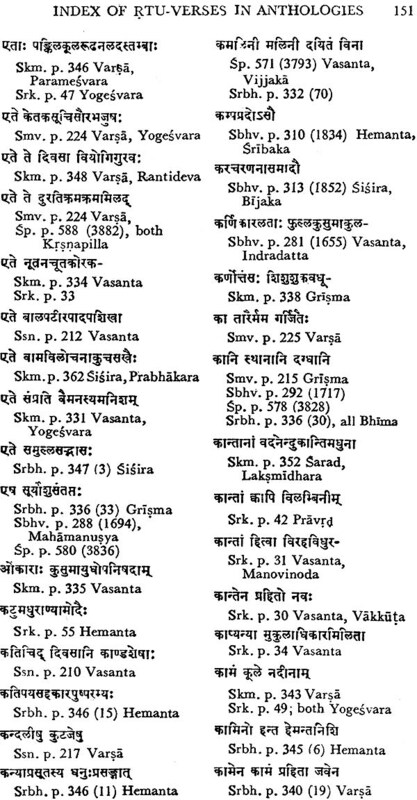 Rtus in illustrative verses in Alamkara works-Bhamaha, Dandin, Rudrata, Vamana, Rajasekhara's Kavyamimamsa and its mini-Rtusamhara, Bhoja's Sarasvatikanthabharana, Visvanatha's Sahityadarpana, Appayya's Kuvalayananda (123-127). Vedanta Desika's Yadavabhyudaya, the Sivalilarnava and Gangavatarana of Nilakanta Diksita, poetess Gangadevis's Madhuravijaya (127-129).